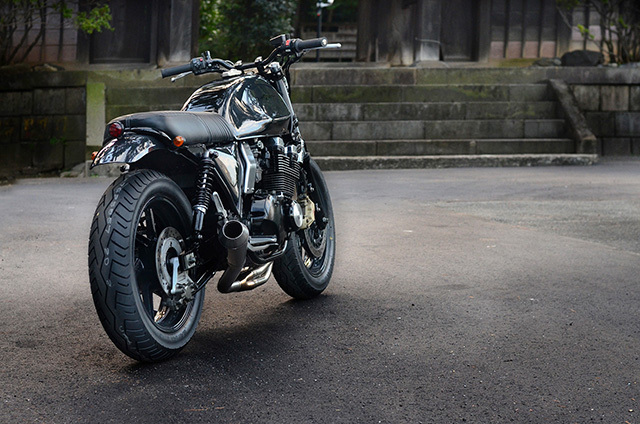 Every Estate Agent has heard it, a request for a large beach front property in a high value suburb for the price of a small car but when confronted with the motorcycle equivalent, Japan’s Speedtractor Industries proved they’re one builder who can give their customer their cake and eat it too with this knock out 2001 Yamaha XJR400. The exact request was for a machine that was more “Kraftwerk than café racer” light but with the brawn of a 4 cylinder, low maintenance and air-cooled and it had to be capable of riding two up, would you like fries with that? But one of the reasons clients go to masters of their craft like the designers, mechanics and technicians at a workshop like Speedtractor is because they can deliver the type of “the client is always right” requests that not every shop can achieve. 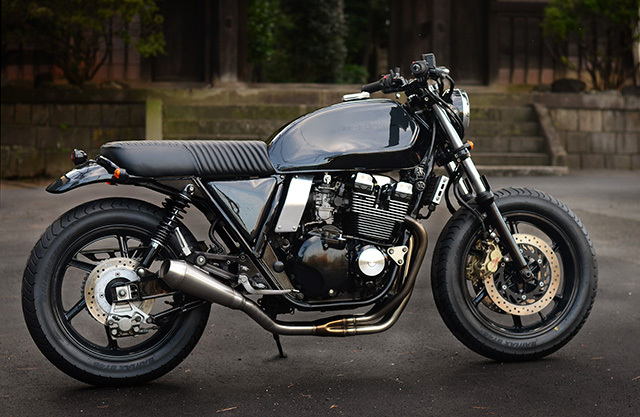 According to Matt at Speedtractor the Yamaha XJR400 “is one of the go to steeds for this generation of boy racers and Bosozoku. Plentiful on the ground in Japan but punished beyond belief”. 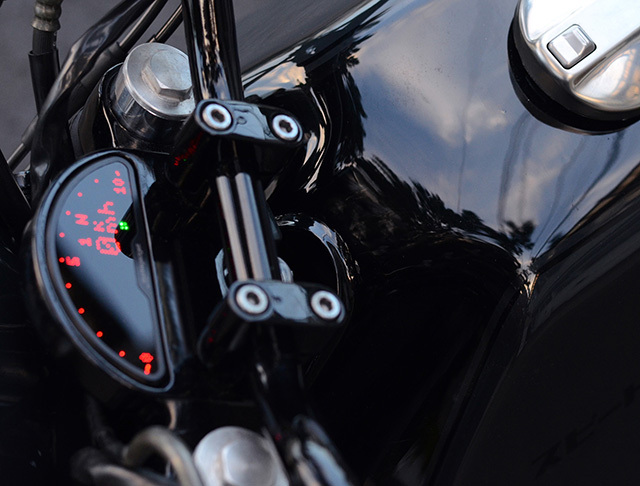 Which made finding a donor bike harder than you might imagine, despite their popularity, is many have been hacked beyond recognition, treated to less than tasteful modifications, slung down the road or had holes punched in the cases when the engine has grenaded from poor servicing. Having looked at over three dozen examples they finally found the right bike and set about the task of delivering on their promise. “We set off to make the engine the hero, pulling back-in every surface we could to make it a compact, visually dense bruiser of a machine with the motor hanging out either side.” Much of this was achieved by ditching the factory plastics from the side and rear that surround the seat, removing even the smallest of items and even fabricating a set of custom side covers that sit inside the frame. But perhaps the finest design choice was the decision to ditch the factory tank for one that would not only set it apart from the hundreds of other custom XJRs, but also to use a tank that’s lines would further extenuate the engine size. The solution came in the form of a vintage Ducati bevel tank the guys had in their collection that has had the underside re-fabricated so it fits millimeter perfect on the Yamaha frame. 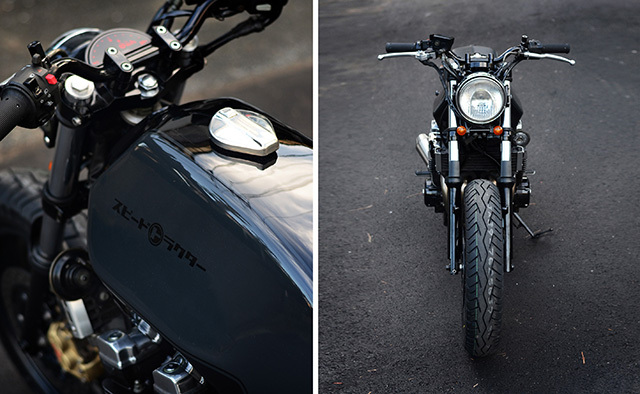 At first glance it may not be easy to spot – this is by design – but the paint work is in fact a two tone mix of deep dark grey with black and a pinstripe of black to separate the colours in such a way as to visually enhance the subtle lines of the Ducati tank. 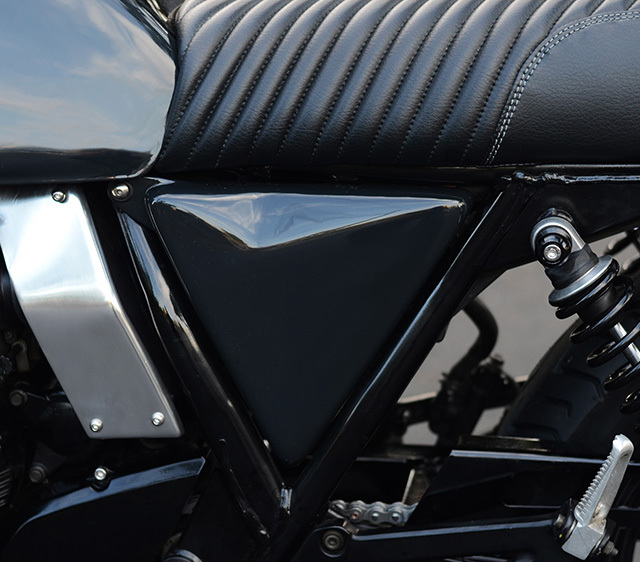 With the rear of the frame cut and hooped a one-off seat base was created to seamlessly fit plumb between the edge of the tank and the newly formed rear end. With this achieved the foam was wrapped and upholstered in a distinctive Herringbone pattern in the tightest tuck roll the boys could manage. Not all engines are created equal and the 399cc 4 cylinder Yamaha slotted into the XJR is one that punches well above its weight. Twin cam and four valves per cylinder it’ll rev like a little 250cc but the extra cubes give it enough capacity to make good torque throughout the rev range for hours of fun in all types of conditions. 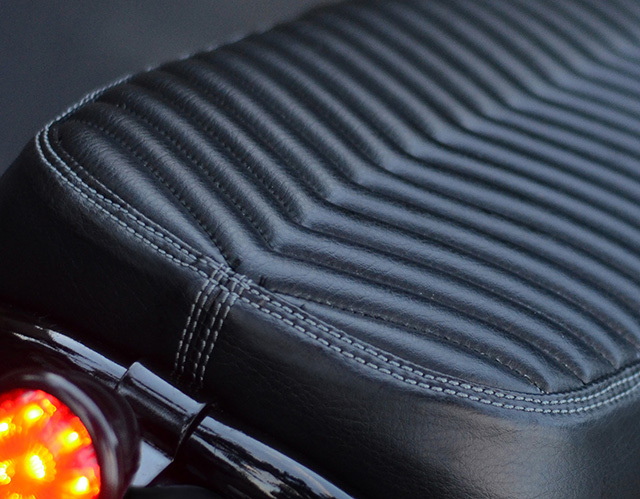 With the clients needs in mind and the drastically varied air temperatures encountered in Tokyo the decision was made to leave the standard airbox in place for the smoothest of engine operation, the addition of hand formed alloy covers though means you’d never know. But the exhaust is where the real music comes from, those four small pots screaming into the cold Tokyo night like a banshee on heat thanks to a fully fabricated stainless steel system finishing in a reverse cone muffler. 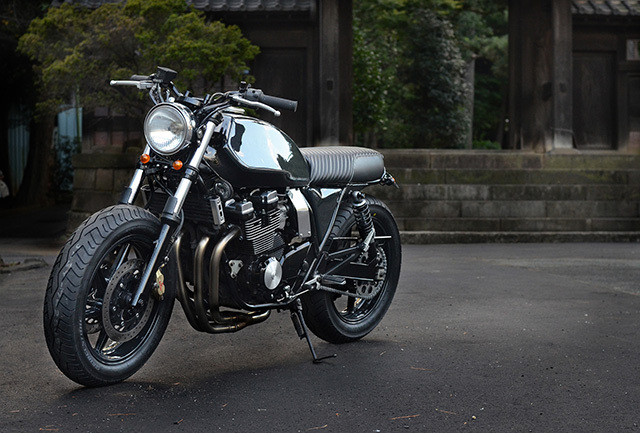 With such a berserk little engine packed into an exceptionally crafted frame the XJR is a great handler straight out of the box, but good can always be improved and Speedtractor has done exactly that. With taller rubber in mind for the build the ride height has been reduced front and rear by 15mm to give the bike just the right stance. While the front forks are lowered through the clamps the rear is drastically improved with a set of custom Ikon shocks with height adjustable progressive rate springs. Stopping power comes courtesy of a single disc rear with a 2 piston caliper while up front twin drilled discs are clamped by a pair of the best in the business, Brembo calipers. 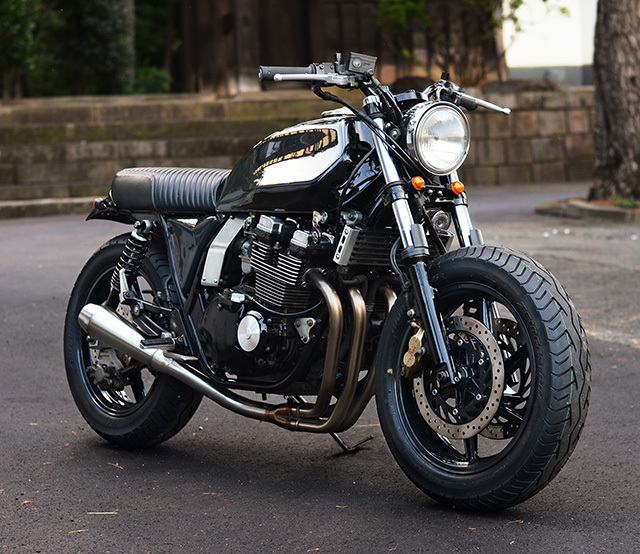 Further setting this XJR apart is the replacement of the standard three spoke wheels in favour of a set from a Honda RC42 that wear the beefy BT45 Bridgestones that add to the big bike look of this little bruiser. If the Speedtractor team has a favourite part to the build it’s not one that jumps out at you – but a small piece of engineering that deserves more than a little appreciation. With the ignition relocated to under the tank the top clamp was removed and machined so that a custom cradle could be fabricated to support the Motoscope Pro digital dash. The perfect execution paves the way for the rest of the controls with an ultra clean look thanks to the blacked out clamps that flow into the risers holding a set of bars all in the same colour. A custom set of grips mate up next to the switchblocks and master cylinder that appear as if they’ve been nicked off a showroom floor so clean are they in appearance. To keep the lighting simple and unobtrusive the four round indicators are tucked in as close as possible and the tail light is a tiny bobber item that seems to appear only as it is illuminated. With the build complete the client couldn’t be happier that all his requests had been achieved and his expectations blown – if only Speedtractor could enter the real estate market too.